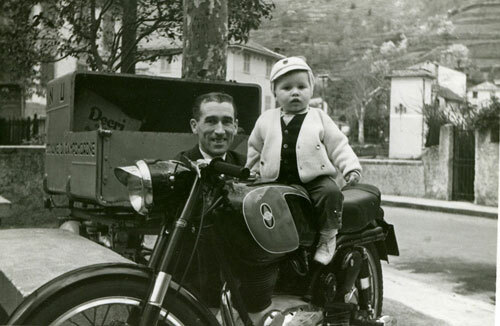 I was born at the end of october 1957 in a suburb of Genoa called Rivarolo. My father Carlo worked for an expedition firm (having previously been fireman and truck driver) and was shortly later to work for a big sugar industry until retirement (in the 1980’s). 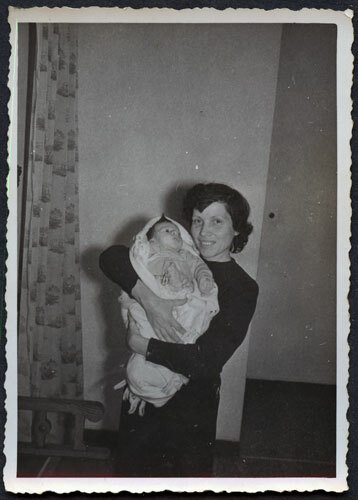 My mother Luigina (Gina) attended home duties. In her earlier years she had worked as an apprentice tailor. When I was born, my parents were more than 35 years old. 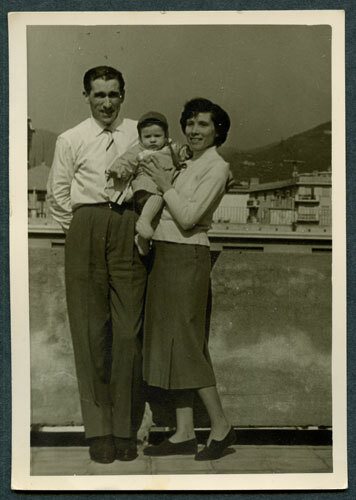 It was most unusual in the late 50′ to have children so late. Before school I had very few friends and used to play mostly with my cousins Roberto (three years older than me) and Rossella (about my age). Most of the time I used to play by myself mostly with toy cars (I loved a big yellow truck I stiil have. Once it fell from the balcony – luckily nobody was killed and the truck suffered only a little dent). I used to paint small pictures and try to sell them (for money) to relatives or to anybody who got the chance to make a visit at home. In spite of that behavior I was extremely shy, mostly with other children. 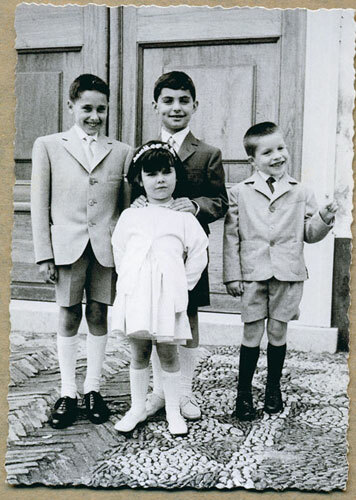 1963: me (at right) and my cousins (on mother’s side): Enrico (died very young in his early 20’s), Roberto (see music chapter) and Rossella. Making friends at the public playground was a complicate process that involved at least a couple of hour of study and preparation, that, when fulfilled, usually had produced the time to go back home. Anyway I was usually in a good mood, except when things wouldn’t go the way I wished. In these occasions the tantrums I was able to throw were legendary (during one of these I cried so loud that I got an inguinal hernia). Ok, probably I was a pain in the neck for my parents. I think that I needed all the attention I could get. And probably it was not enough anyway. One nice detail: I remember that I was amazingly fond of girls with long hair. I remember a girl that I used to call “Bimba Capelli” (Hair-Girl). I was really enjoying my life, in those days. I liked to spend my time with my mother and I couldn’t wait for the moment my father was coming home from the work. My salute was: “what did you bring to me?” I learned to read before entering school. The golden age was about to end. School time was approaching. 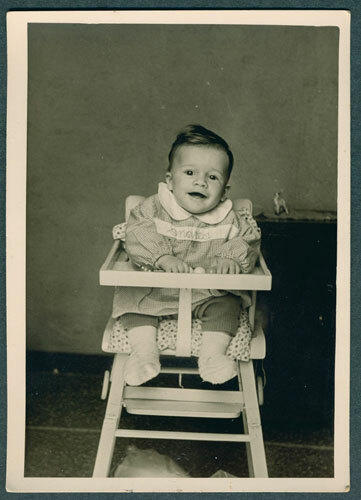 In 1957 Andrea Gamba weights at birth about 4,3 Kg (9lb 7oz). At 3 years tastes his first sip of beer (and to his parent’s big surprise) likes it very much. He likes the girls with long flowing hair, eats very little. He has a wheelbarrow (which gets lost moving from Rivarolo to Genova), a pedal tin car and a tricycle (who falls apart when he rides it together with his cousins). 1959, August. 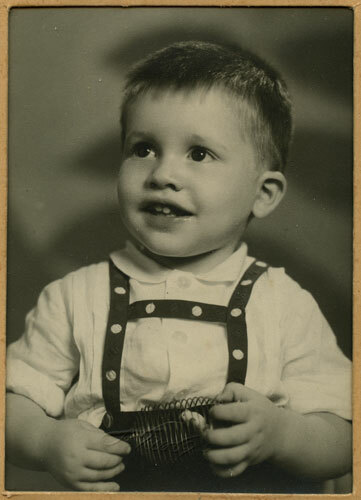 Me posing in front of a photographer for my very first portrait at the age of 22 months. 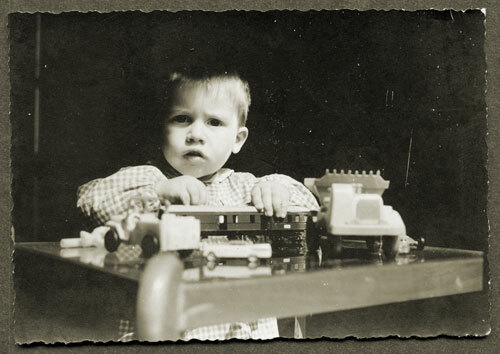 1959 – Me with some toys. 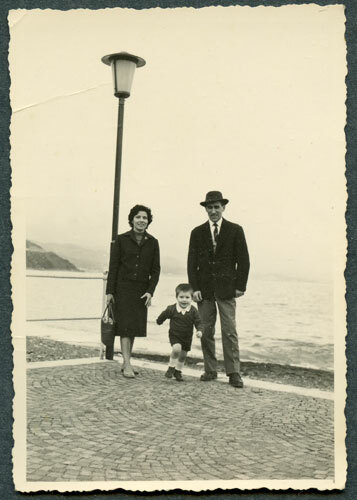 1960 – Mother and father by the sea. 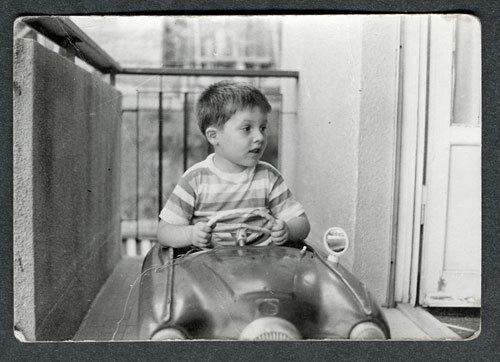 1961 – Me with my red tin car (The balcony was 1 meter deep and two meters wide. The fabulous red tin car was 1,20 mt long so all I could do was pedal twice and half and then walk back.). 1985 – 1989: 07 – Get a job!